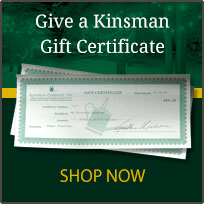 *** Identical Gift Certificates must be ordered as separate line items. *** Can be redeemed by phone, mail or in our retail store. To redeem the gift certificate on-line, please enter the gift certificate number and amount in the box titled Comments or Instructions during the checkout process. 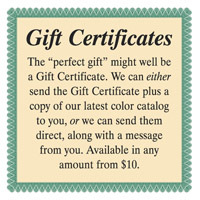 The dollar value of the gift certificate will not be reflected on the total when the order is submitted but will be applied when the order is processed. I purchased for my step-mother-in-law for mother's day, she is an avid gardener. The catalog offers so many items she will just love, just didn't know which to choose.